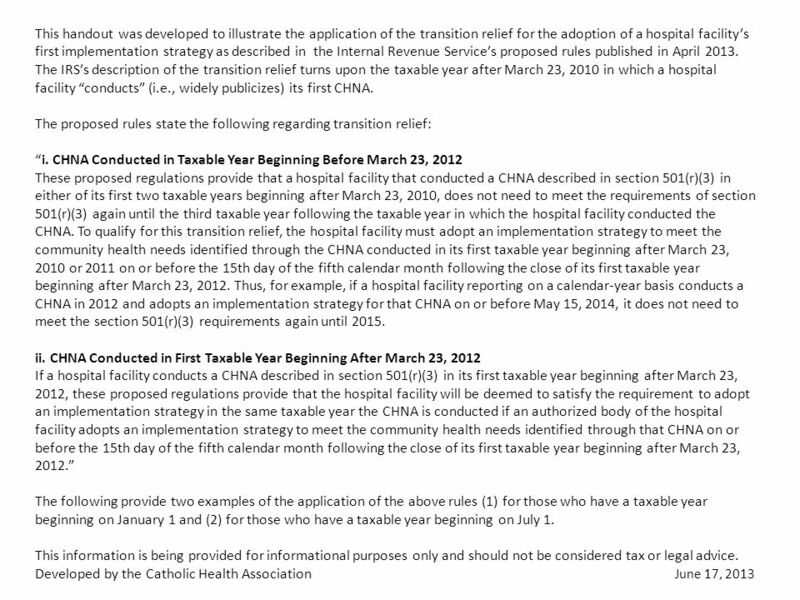 3 AND, next CHNA required to be conducted in 3rd taxable year following taxable year in which initial CHNA conducted. 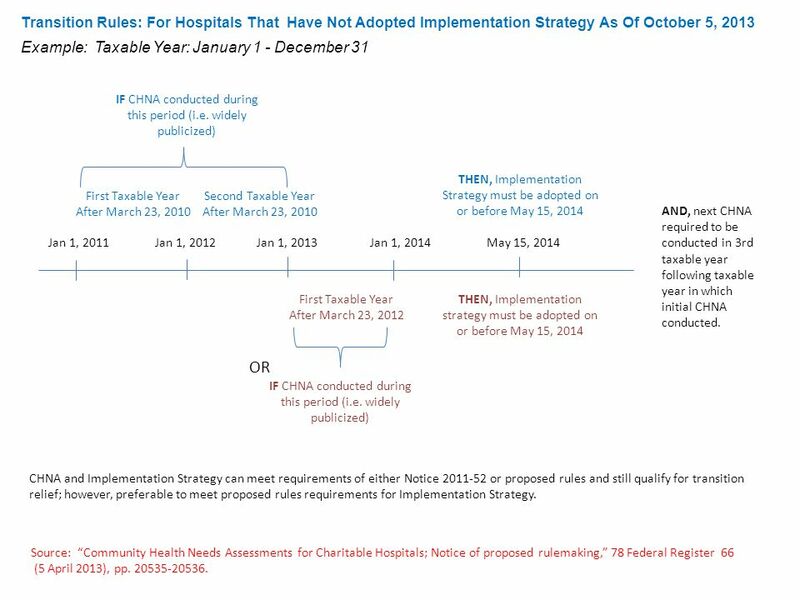 Transition Rules: For Hospitals That Have Not Adopted Implementation Strategy As Of October 5, 2013 Example: Taxable Year: July 1 – June 30 July 1, 2010July 1, 2011July 1, 2012November 15, 2013 First Taxable Year After March 23, 2010 Second Taxable Year After March 23, 2010 IF CHNA conducted during this period (i.e. 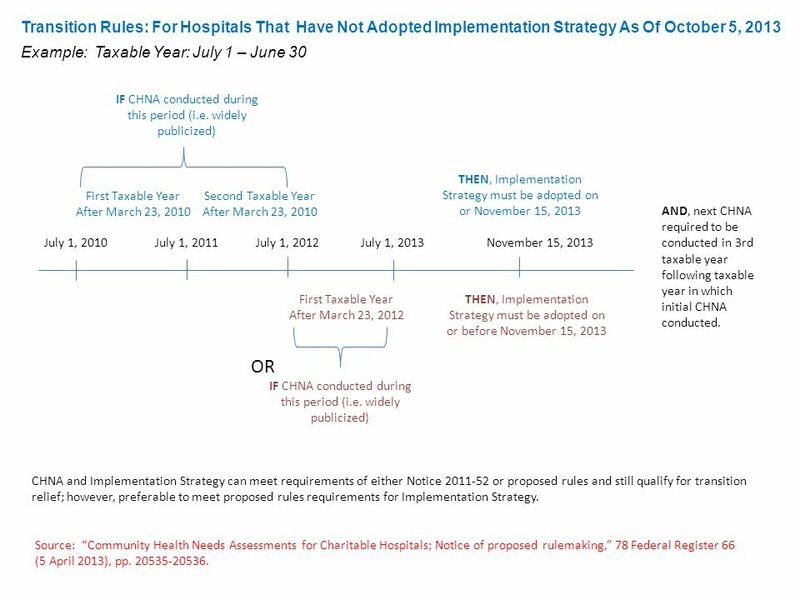 widely publicized) THEN, Implementation Strategy must be adopted on or November 15, 2013 CHNA and Implementation Strategy can meet requirements of either Notice 2011-52 or proposed rules and still qualify for transition relief; however, preferable to meet proposed rules requirements for Implementation Strategy. July 1, 2013 First Taxable Year After March 23, 2012 THEN, Implementation Strategy must be adopted on or before November 15, 2013 IF CHNA conducted during this period (i.e. widely publicized) OR Source: “Community Health Needs Assessments for Charitable Hospitals; Notice of proposed rulemaking,” 78 Federal Register 66 (5 April 2013), pp. 20535-20536. Download ppt "This handout was developed to illustrate the application of the transition relief for the adoption of a hospital facility’s first implementation strategy." Unit of Measurement Day 1 9/23/2013 Day 2 9/24/2013 Day 3 9/25/2013 Day 4 9/26/2013 Day 5 9/27/2013 MeanMedianMode Max Temperature Precipitation Air. Road Map To Development September 2013 December 2013 February 2014 April 2014 July 2014 Data Submission WEQ 008 Assessment CO 283 Report GTL COs Draft. 2011 Planning Commission Annual Report Mayor & City Council Presentation April 10, 2012. Office of Operations 2010 Fall Conference State Agency Compliance with Prompt Contracting Regulation Dan Agosto, John Moriarty & Patricia ODonnell. 3rd Quarter 2013 July 1 – September 30, 2013 EVERY WEEK COUNTS OKLAHOMA AGGREGATE DATA. World Meteorological Organization Working together in weather, climate and water Scale of Assessments 2012 and 2013 Congress WMO. Agenda I. Purpose of the MOVE Act II. Impact on May Uniform Election Date III. Changing Elections to November IV. Unstaggering Terms to Keep May Date V.
2007-2008 School Year Calendar You can print this template to use it as a wall calendar, or you can copy the page for any month to add it to your own presentation.